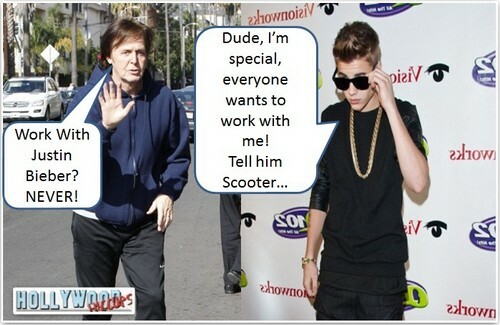 Paul McCartney does not want to work with Justin Bieber. Word on the street is that Justin had decided that working with the Beatles legend would be just the thing to give him more street cred. So Justin and his posse pitched the idea to Paul’s people of a Paul and Justin duet. Justin figure Paul did it with Michael Jackson, why not him? Not only did Paul nix the idea he refused to take Justin’s calls. Paul basically thinks Justin is a flash in the pan and he is not an artist that should be taken seriously. Good luck with that Justin! What do you think, will Justin convince Paul to record a duet with him or is he wasting his time? Hit the comments and let us know your thoughts.